Yellowstone Art Museum, Billings, Montana. July - September 2007. Prichard Art Gallery, Moscow, Idaho. June - August 2010. Herrett Center for Arts and Sciences, Twin Falls, Idaho, Feb - March 2015. The installation is comprised of ten freestanding sculptures. Each sculpture consists of a small motor resting on the floor. Attached to each motor is a metal panel that acts as a sounding board for an audio signal. The motors act as audio transducers, turning back and forth in a circular pattern to produce sound. Audio amplifiers and a computer are used to control the input signals. This installation emphasizes the movement of the metal panels to unite the sonic and the visual. The movements of the motors are algorithmically generated to produce changing visual and aural patterns. Very low frequency signals that cannot be heard are perceived only through the slow oscillation of the metal panels. Medium frequency signals are both seen and heard through the movement of the panels, while high frequency signals are only heard. 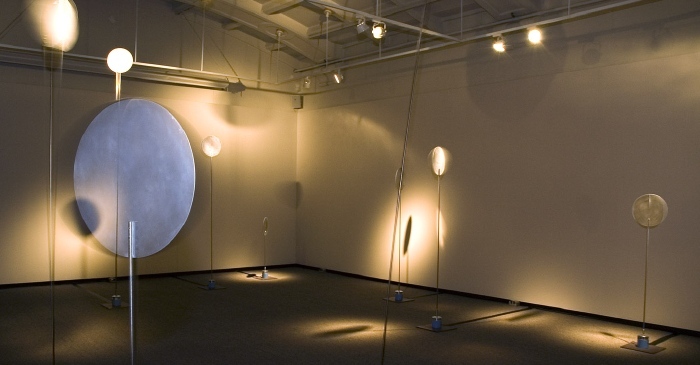 By changing the geometry of sound transduction this installation creates an always-changing environment of sound, vision, and movement.